In furtherance of the launch of a suite of Standard Form of Contracts (the “SFC”) on 15th August 2017, the Asian International Arbitration Centre (the “AIAC”) is delighted to introduce its Standard Form of Design and Build Contracts. Successful coordination of construction projects significantly depends on effective and efficient administration of the contractual chain, including design and build contracts entered into by the Contractors and Sub-Contractors. 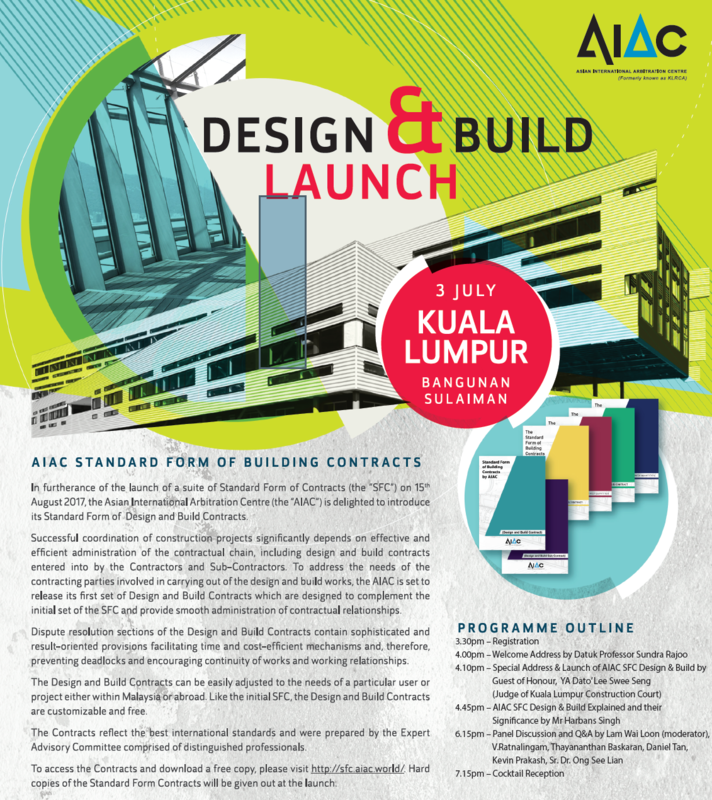 To address the needs of the contracting parties involved in carrying out of the design and build works, the AIAC is set to release its first set of Design and Build Contracts which are designed to complement the initial set of the SFC and provide smooth administration of contractual relationships. Dispute resolution sections of the Design and Build Contracts contain sophisticated and result-oriented provisions facilitating time and cost-efficient mechanisms and, therefore, preventing deadlocks and encouraging continuity of works and working relationships. The Design and Build Contracts can be easily adjusted to the needs of a particular user or project either within Malaysia or abroad. Like the initial SFC, the Design and Build Contracts are customizable and free. To access the Contracts and download a free copy, please visit http://sfc.aiac.world/. Hard copies of the Standard Form Contracts will be given out at the launch. Join our mailing list to stay updated.